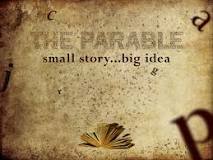 A parable is a succinct, didactic story, in prose or verse, which illustrates one or more instructive lessons or principles. It differs from a fable in that fables employ animals, plants, inanimate objects, or forces of nature as characters, whereas parables have human characters. A parable is a type of analogy. I was at the usual bus stop staring at my watch and impatient to get to work. “Crap, I won’t have time to get a coffee”, I thought. Then she caught my attention. Her unruly and disheveled hair flew behind her in the wind as she bolted past me. Her green eyes were wild with expectation and her gate was long and certain. She was on a mission. She pulled me out of my worry and I set my briefcase on the bench. I could not help but follow her as she weaved in and out of unfamiliar streets as her long sky blue robe swayed behind her, threatening to get snagged on a lamp-post or caught in a passing bicycle spoke. Her arms pumped fiercely as if she were in a race. When she passed a dog tied tightly to a bicycle rack on the corner of Park Street she stopped momentarily and slipped off the chain collar, then scooped up the brown-eyed beagle into her arms and continuing on as if she had expected him. I could not keep up with her and began to fall behind as she continued to rush somewhere I imagined to be very important. Suddenly, a boy with his skateboard and then a large blackbird and some strange old man sitting near the park joined her and now there were many people following her. She turned down an alley where a homeless man living in a cardboard box watched her come near. She stopped, her face a breath from his startled eyes as she smiled a smile that nearly knocked him to his feet. Then she took his hand and pulled him up and without a word he joined the growing crowd of children and old people and animals that become a wave of energy pulsing through the streets. The growing mob of unlikely people started climbing up to the top of the small clearing overlooking the city. ‘What fun life is. Thank you for joining me”. A short story can pack a punch. There is not need for long chapters, details or perfect prose. A parable is rich with imagery, with feeling and with a great outcome: It leaves us pondering life. This is what a good story should do if it doesn’t make us weep or laugh or want to punch the door out first. Jesus was said to be one of the best storytellers around and through his parables, whether you are Christian or not, lessons on living have seeped into the culture of everyone’s life in one-way or another. He told parables which always had an “Aha” to be learned. He told parables about the ten virgins, the Good Samaritan, the lost sheep and the Prodigal Son. We’ve all heard about the mustard seed and a grain of sand or hiding your light under a bushel. In the end these short, visual, descriptive lessons on life can be a great way to start writing your story. Most writers are crippled and start sweating at the white, empty page staring back at them like a challenge. Most of the time there is a book to be written, all 300 uncertain pages. When a book is looking over your shoulder it is typical to simply say…”oh I will write ten pages today” and then start sweating all over again. Oh the pressure we put ourselves under. I have been writing what I call “morning pages” for ten or more years. Just a free-flowing stream of consciousness that starts without any intention and always ends up somewhere I never intended to go: A poem, a confession, a rant. Lots of times I rant. But, more often than not, it is a story in the making. A little seed of an idea that I can come back to. 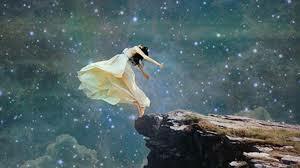 It is in this uncharted territory of unexpected words where a story is born. When I was living up in Crested Butte, Colorado in my “let’s open an art gallery and sell contemporary art to people who want cowboys and buffalos”, I was watching the news about a couple stranded in a snowstorm and living in their car for several days. I was seized by the need to make that into a great movie. I researched the couple, outlined the story idea, and then sat down to start writing a heartwarming screenplay about love, loss and redemption (since that’s what all movies are about in the end). By page 12 the story demanded to go in another direction and no matter how hard I tried to pull the story back into formation it wandered outside the lines of my own psyche and turned itself into a 120 page paranormal thriller with Jeremy Irons and Jodi Foster. I was captive to the story…it would not let me go and in the end the screenplay won several screenwriting awards. But it was not even close to what I had set out to write. What did I do wrong? What did I do right? How did my idea morph into something so totally a product of my relentless imagination? Or was it that the story itself is energy that exists outside of my idea of time and space and was just waiting to be born? I have learned that this is truer than you might think. The story was able to take me somewhere unexpected simply because I was not attached to the outcome and I just showed up each day, punched on the computer, got my cup of tea, put on my headphones to listen to movie soundtracks while I wrote and in the end allowed the muse to take the characters where they needed to go. Working this way is exciting and is a bit like tracking an animal in the woods. Most of the time you think you are following a deer and in the end you find out that it is Bigfoot. So start with a seed. With a sentence from how you feel about a photo, use a line of a poem and take off…see where it leads you. You just might have a whole lot of fun! This entry was posted in Uncategorized and tagged parable.